Retail slot developer becomes latest UK company to join Gauselmann Group. Blueprint Gaming, part of the Gauselmann Group, has acquired UK-based games developer Project in a deal which further expands the company’s product offering. The acquisition will enable Blueprint Gaming to strengthen and diversify its already robust game portfolio. Project’s titles are set to be adapted for the online market as well as being integrated into Blueprint Gaming’s machine offering. 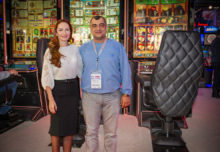 Project has firmly established itself as a pioneer within the gambling industry, with more than 30 years’ experience in the UK retail market and a games portfolio of over 50 titles, including the hugely popular Mega Bars and Find the Lady Poker. Project’s management team will continue to lead the day-to-day activities at its south London studio, while the design and development departments from both companies will be forming a close and collaborative relationship with the intention of bringing further game innovation to the online and retail sectors.